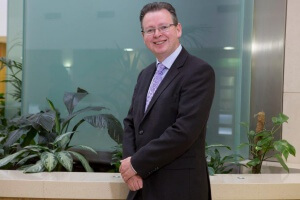 James O’Donoghue, formerly Head of Finance at Blackrock Clinic, has been named Chief Executive of the private hospital today. He will replace Bryan Harty who has held the position for 16 years and is returning to England. James has worked in Finance at Blackrock Clinic for 29 of the 30 years the hospital has been open. As Head of Finance, he worked in partnership with the departing CEO, leading the hospital through its highly successful €150m expansion. This programme delivered 60 extra inpatient beds (all of which are in single occupancy rooms in line with hospital policy), 50 day care beds, an expanded Emergency Department, a state of the art, 12-bed ICU, The Blackrock Clinic Centre for Cardiac MRI, a Hybrid Operating Theatre for EVARs, a new renal dialysis unit, a €7m Central Decontamination Unit and a multi-storey car park which brought parking at the hospital up to 520 spaces. O’Donoghue has also been integral to the management team which oversaw the building of Blackrock Clinic’s excellent reputation. The hospital is notable for its positive patient outcomes, many of which outstrip international standards. The hospital’s most recent patient satisfaction survey showed that 91% of patients rated the quality of service at the hospital as very good/excellent. O’Donoghue will work closely with the Board of Blackrock Clinic on the hospital’s evolving business strategy and continuing the hospital’s excellent reputation for patient care. The hospital plans further developments to ensure it stays at the forefront of medical and surgical trends and technologies while delivering the best possible outcomes for patients. “In the last 30 years, Blackrock Clinic has assumed a leadership position by introducing the newest and most minimally invasive procedures to our patients. Bryan Harty has been instrumental in driving these developments and he is leaving the hospital as a strong, profitable and well-run business with an exceptional reputation for its care of patients. On behalf of the entire hospital, I’d like to thank him for his work”, said O’Donoghue. Of his own tenure, O’Donoghue said: “I will continue to develop Blackrock Clinic’s procedures and facilities in line with the fast-paced developments in healthcare, and ensure that we continue to deliver the best possible outcomes and care to our patients”.